What a crazy week! To all those people I said I was busy to this weekend–I lied! You see, I thought we would be hosting family this weekend, but it seems that plans have changed. Such is life. I will spend my weekend cooking, wining (with wine as a verb of course) and eating as the weather outside looks a bit glum. I was happy to wrap up my #MiniMarch month on Instagram–I shamelessly took pictures of Poppy all month and got lots of love from other #Miniacs 😉 But the rains are here now and that means things are about to get borrrring. 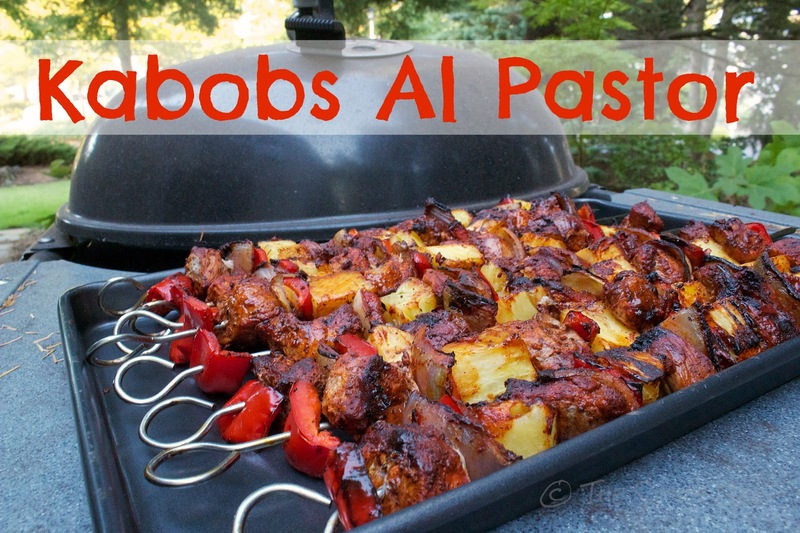 My hopes are that this recipe gets you out grilling in the rain!! Combine achiote paste, chilis en adobo, adobo sauce, olive oil and water into a small food processor and blend until smooth. Watch out for little chunks of achiote! Blend until you are confident of its smoothness. 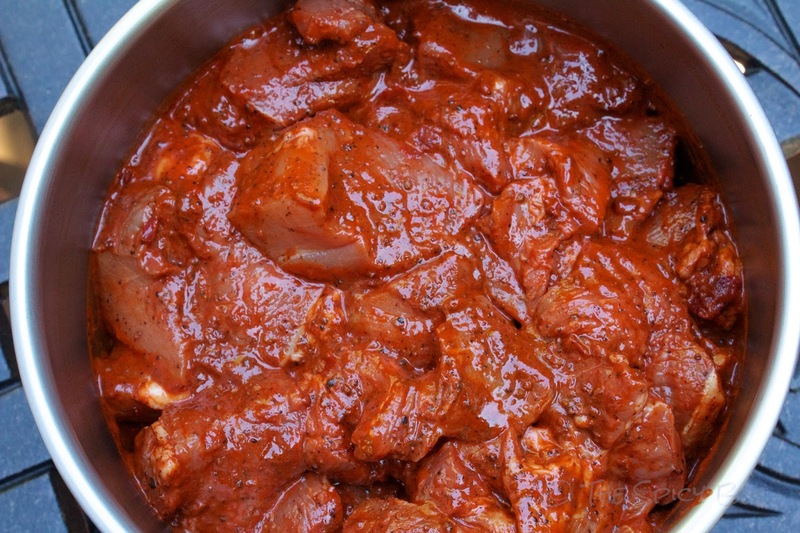 Marinate the pork in the sauce and set to the side. If you’re preparing for a party–feel free to complete this step hours ahead of the party and let the pork and marinade get to know each other a little bit better in the fridge! Head outside and heat up the grill. Now, gather the cut fruits and veggies and ready the skewers. If cutting up a pineapple seems a bit daunting I highly suggest checking out this how-to video. Carefully load up the skewers to your liking. One thing that I love about this recipe is its incredible flexibility. Can’t find any red pepper at the store? Go with another color or up the heat a bit and go with smaller cuts of a spicier pepper. Don’t like onion? Try this recipe with some sliced zucchini instead! No ripe pineapple? Well, I might be out of luck in my case, as that’s usually the whole reason I want to make these in the first place! I love a good pineapple. Ok, looks like we’re ready to grill. 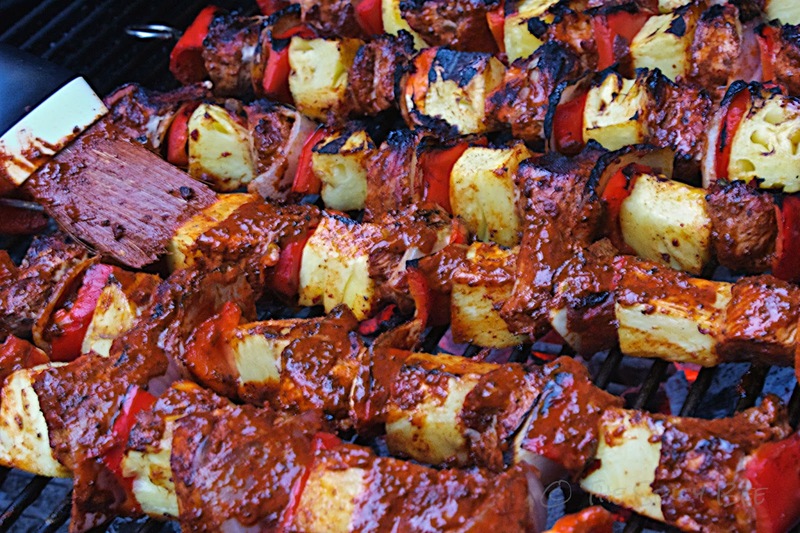 Bring whatever leftover marinade to the grill along with the skewers and brush it on as you put them on the heat. Feel free to spread the marinade liberally on both sides as you cook. About 4-5 minutes per side on a hot grill should do it. This recipe is fabulous for a dinner party or a cook out as prep is simple and the result will feed many! In the pictured case we doubled the recipe–with the ingredients given above you will serve 4 easily. The versatility of this recipe doesn’t stop at the fruits and veggies used either–you can also switch up the meat! You might have noticed that it is way too nice out for these pictures to have been taken this week. That’s because we actually did this recipe for the first time last summer at my in-law’s. We made the recipe again this week with NY Strip instead of pork and I fell in love all over again! Have you fired up your grill yet this year? Looks delicious and is entirely WRONG to share right before a WET weekend. 😉 Can’t wait for better weather so we can pull out the grill! Again – another dish that I am going to try. I love that every Friday I get a new recipe from you to try! Maybe even tonight! I have skewers at home too… perfect!! 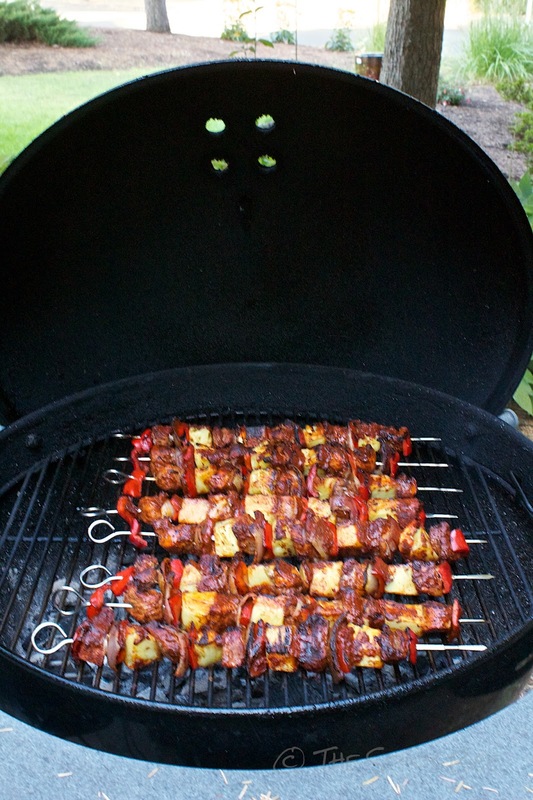 Oh, I am so trying these when BBQ weather comes back! yum! can’t wait for grilling weather. I am so trying this. I LOVE Al Pastor! Yum! 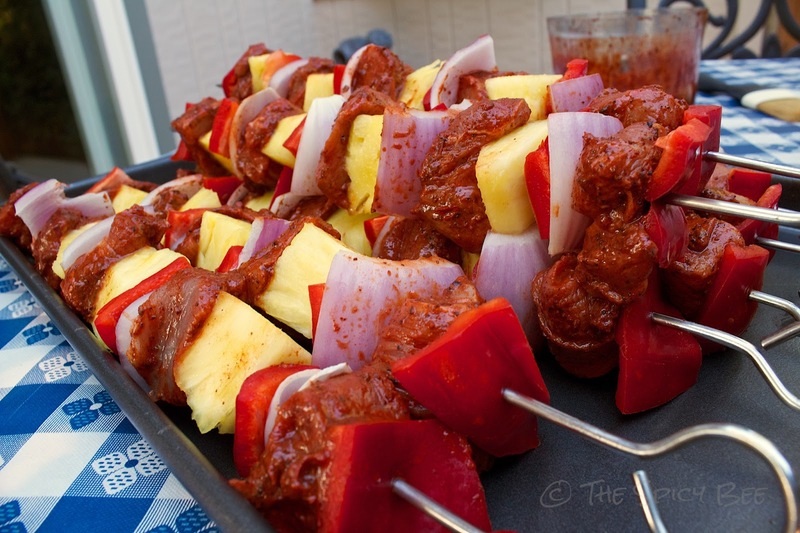 We love Al Pastor, this is on my list!